Music enriches worship at St. Jude through reflecting on the message, reiterating a scripture passage, or simply praising the Lord. We choose each Sunday’s music carefully and use sacred music from varying genres. No matter what the genre, we always consider the piece’s inherent musical value and connection to scripture. The core of the music ministry, the choir, presents an anthem or reflective piece of music every Sunday between the months of September and June. The all-volunteer choir, ranging in age from teenagers to seniors, averages eight people and usually sings SATB parts. 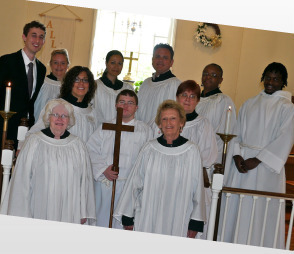 Besides singing, the congregation of St. Jude includes some particularly talented instrumentalists. Frequently, these instrumentalists share their gifts in praise of the Lord. 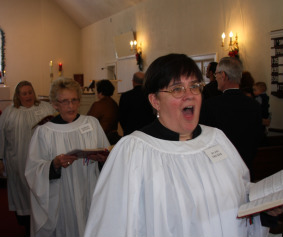 On occasion our choir joins with choirs from other churches for a special event or performance. If you have an interest in joining the choir or sharing your musical gifts, we would love to have you! The choir rehearses once a week and strives to have as much preparation as possible before singing for the Lord.